Last year, we saw the Nursery's video for "This Wild Heart," and now the Toronto band have unveiled another video from their 2013 EP Carnival Nature, this time for opening cut "Lysergically Yours." The song is a quirkily bouncing, carnivalesque pop-rock number, and the video by directors Devon Stewart and Alex Pulec captures the playful strangeness by showing the band performing in a tinfoil-wrapped room. 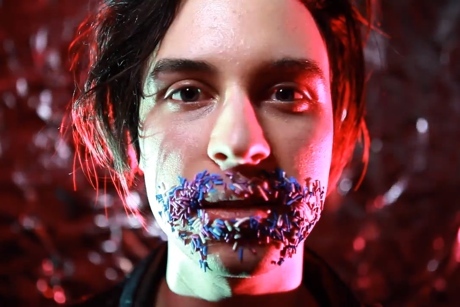 This is intercut with some weird shots of colourful sprinkles stuck around people's mouths, as if their lips were donuts.